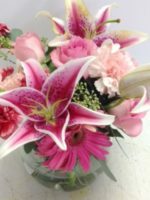 Custom designed in a round bowl, beautiful pink flowers such as roses, gerbera daisies, stargazer lilies and more are perfect for a baby, an anniversary, a birthday or a new home. 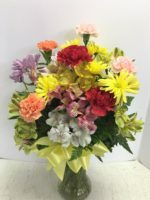 We call this Going Round and Round because it’s an adorable floral arrangement designed in the round. 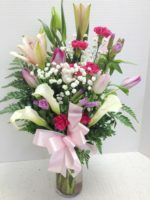 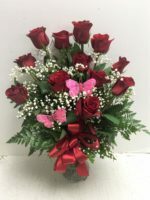 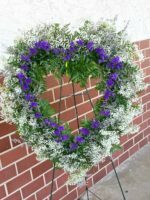 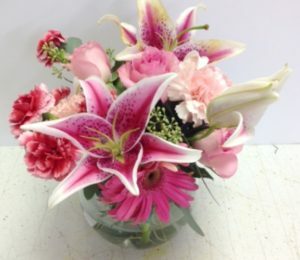 Custom designed in a bowl, beautiful pink flowers such as roses, gerbera daisies, stargazer lilies and more are perfect for a baby, an anniversary, a birthday, graduation, a spring holiday like Easter or Passover or Mother’s Day, or a new home. 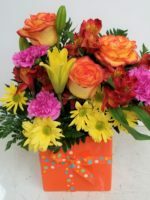 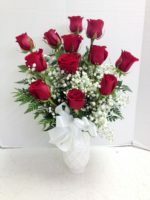 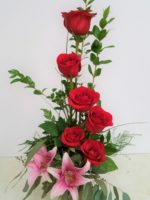 You might prefer short sassy red roses or Happy Birthday Short & Sassy Flowers.